The Autism Society of the Philippines has long been immersed in growing Municipality of Carmona, Cavite, where one of our chapters have become both contributors to and beneficiaries of best-in-class PWD programs. Carmona, Cavite, best known for good governance, established the "Disabled Persons Coordinating Office" in September 2000 -- ahead of many cities in Metro Manila. Employing a community-based rehabilitation model lovingly labelled "Kilusang Kabalikat ng may Kapansanan para sa Kinabukasan" or 4K, the city has innovated on the projects that helped them win the coveted Apolinario Mabini Award in 2008. The local chapter of the Autism Society Philippines have become one of the municipality's partners in their enhancing program efficiency; and was recognized as the city's top NGO in 2012. 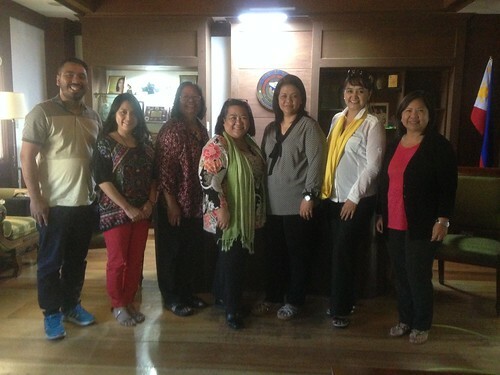 At the heels of the National Autism Consciousness Week, Mayor Dahlia Loyola played host to a team of autism advocates from Unilab Foundation, Autism Hearts Foundation, Association of Adults with Autism and the Autism Society Philippines (represented by National President Mona Magno-Veluz) on 6 February 2015. After a brief presentation at the city hall, the group toured the PDAO centers where children with disabilities were receiving intervention in small groups while their parents were working in the livelihood area. The group was witness to the organized and professional production of export quality bags (made from rolled and weaved newspaper) and of tofu by persons with disabilities and their families. The Mayor gamely shared that she will be personally looking into hiring one or two people with autism to join her staff. Carmona has made a huge difference in making possible early intervention, education and employment of the individuals who live with autism. It is heart-warming to see that there are local government units that recognize the potential of people with disabilities. May the Municipality of Carmona serve as an inspiration others to nurture this largely untapped pool of talent!